Rihanna was spotted leaving her hotel in New York City yesterday. Rih was on her way to perform at the Victoria’s Secret fashion show. She wore a t-shirt from Trapstar, black shorts and her favourite Christian Louboutin Sea.nn Girl over-the-knee boots. 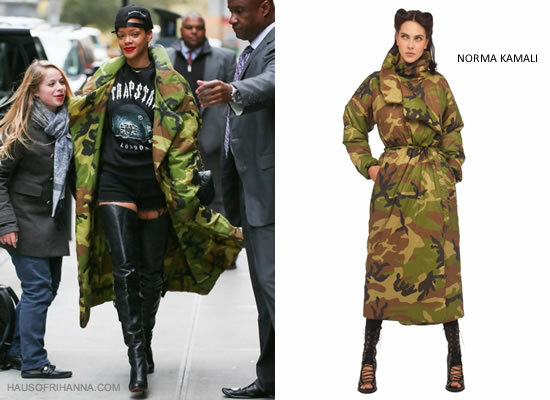 However, the star of this outfit is the camouflage Norma Kamali sleeping bag coat. A coat like this could be overpowering but Rih rocked it with total confidence.